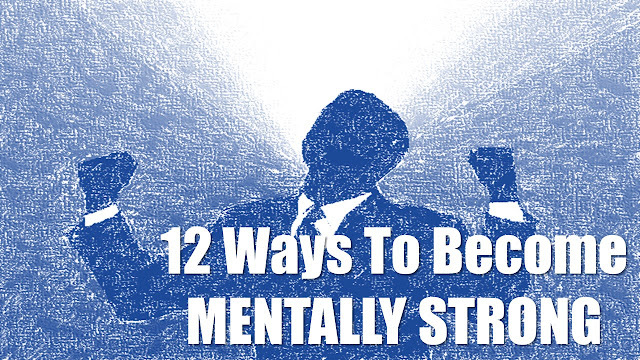 12 Ways To Become Mentally Strong - Motivate Amaze Be GREAT: The Motivation and Inspiration for Self-Improvement you need! When you're going through hard times, people always say things like: "stay strong", "you have to be strong". But what do they real mean? Is this a good advice or it has become sort of "cliche"? Are people weak sort of speak? Well, in essence we think that's a short advice, that can lead to various interpretations. We can get strong just by going to the gym lifting weights. We can get strong by taking some kind of medicine that gives us immediate strength. Will those work? Are we so desperately weak? Maybe for the moment, but what we really think people mean when they say you must be strong, is a reference to the mental aspect. A strong mindset can get you through anything and it's crucial when it comes dealing with hard times. It's also major when it comes to being amazing and achieving. Past experiences can have a dreadful effect on your future plans if you hang on them forever. Whatever negative feelings you may feel from your past, they can make you weak, you got to solve them and let them rest in peace, were they belong, in the past! Whatever you aren't good at, you can get better at it and improve. You don't have to become the best in the world doing it, but if you improve in one weakness it's one less thing you have to be worried about. Imagine if you improve in ten? Twenty? Get the picture? The less weaknesses, the more confident you will become and therefore, stronger mentally. Nothing better than achieving what have you planned out. Most people plan a lot, do to little, and never finish what they started. This is a problem because anytime you don't finish, deep inside, you feel kind of incomplete, and that will make you weaker with time. As soon as you plan something, execute! You may not achieve the goal right away but, you are closer to do it than when you started. We all talk with ourselves, how should one talk with his own self? It's crucial to have the right words to say and the right questions to ask, because words generate action, good or bad, it depends on the content. Start by listing what kind of things you say to yourself in a daily basis. Start to emend what you don't like on that list, by writing an alternative sentence in a positive and productive way. Use reason and logic when making decisions, not what you feel at the time. Your life has a purpose, you have goals to accomplish. Those are your guidelines, anything that doesn't contribute to them will stop you, emotions are one of those things. Stay calm, remember your purposes and keep on going regardless of circumstances. When other people accomplish something be happy for them in a genuinely way. You can do that by seeing them as part of your own team. Their wins don't mean you lose, on the contrary, their wins are your wins, because you are part of a team. It can be your family, your friends, your connections, your working peers, you can have all those teams. Fears can hold you back, don't let them control your life. Be open to change, practice the skill of adjusting, instead of giving up things because you fear them. Learn with your failures, become better and better. Don't let your mistakes be the reason why your desire diminish. I has to be the opposite, get excited because now you know what you shouldn't do. Use your time wisely, be productive refuse to spend time on things that will make you no good. It's not about what people think you can do, but what you actually can do. Work ethic is a major part of becoming strong on the inside. You become self-confident because you know you practice and practice, enough to have the necessary amount of skills to make things happen. You can work on your mind countless hours, but you can't forget the place where all your organs and systems live in: your body. By taking care of your body you are also strengthening your mind. A good nutritional plan and exercise routine are enough to make this connection. Never disclose the power that learning can have in your life. Be a constant learner, because time and time again, people thought that they knew all they needed to know, but the learning process prove them wrong. You can always get stronger and stronger by having the ability to learn.